Prepare sitaw (long beans); wash and pat dry. Cut each into 2 in. lengths, ends discarded. In a large skillet, heat oil over medium heat. Sauté garlic and onions until fragrant and translucent. 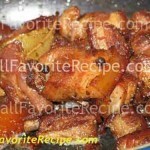 Add pork belly slices; stir-fry for about 3 to 5 minutes or until lightly browned. Add vinegar and bay leaf; stir. Continue to cook until vinegar is absorbed and reduced. Pour in soy sauce and water. 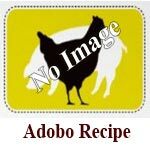 Bring to a boil then reduce heat to simmer; allow mixture to reduce and renders fat. Season with salt as needed and black pepper generously. 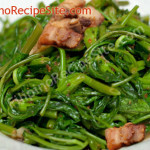 Toss in sitaw (long beans); continue cooking until long beans are tender. Transfer to a platter. 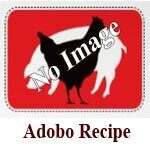 Have You Tried These Other Filipino Adobo Recipe ? Make me generous, Lord, and give me the grace to share my blessings with everyone, and not just with those I love. Amen.